I was inspired by Dan Dos Santos' "Top 10" list of best art books for 2010 over at Muddy Colors and thought I would put together my own. There are many fine books over on Dan's list that are not on mine, but easily could have been. #1 The Legend of Steel Bashaw by Petar Meseldzija: The first "Dan Dup" TM shows up early . I had been hearing a lot about this book, and finally got a chance to check it out at IlluXCon 3. It is a perfect fairytale (of which I am a huge fan). #2 The Art of Drew Struzan: A great book loaded with comp work. I am a fan of Mr. Struzan's work, but I flip for his sketch stuff. His design and compositions really go to another level when unfettered by the constraints of the market place. This is a man who truly takes commercial art to a fine art level. This a dream come true for fans of horror films and European style movie posters. I have always preferred the Universal films to the Hammer films, but Hammer gets the clear nod in the poster department. 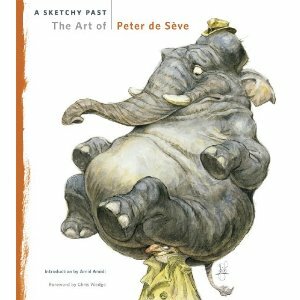 #5 A Sketchy Past: The Art of Peter De Seve- If there is one regret I have this year it is that I did not pick this up when I had a chance. Now it is sold out and the aftermarket price is upwards of $250. Luckily there a second edition coming soon. I will not make this mistake again. #6 Color and Light by James Gurney: One of the most informative books to come out since... well, Mr. Gurney's last book Imaginative Realism: How to Paint What Doesn't Exist . Both of which can be purchased from Mr. Gurney's website Dinotopia Store. #7 Framed Ink by Marcos Mateu-Mestre: An absolute must have for all visual storytellers. Geared towards the storyboard/sequential artist there is more than enough information here for all artists. #8 Spectrum #17: Another "Dan Dup" TM. Not really to much to say here, other than every year there is one art book you can order sight unseen, and this is it. #9 James Bama Sketchbook: A great look into the prepwork of one of my favorite illustrators. It is especially informative to see the looser gestural work of someone who normally works so tight. The addition of some of his life work while studying with Frank Reilly made this a must own for me. #10 Harvey Dunn: Illustrator and Painter of the Pioneer West: The last "Dan Dup" TM, this is because this book should be on everyones list from the most jaded of career illustrators, to the young novice, to the aficionado. There is something here to remind everyone that we were fanboys first. I didn't realize the DeSeve book had gone up that much. I was fortunate enought to pick it up when it was still inexpensive. It is a great book! I didn't realize it until I went to make this list. I think it was yours I looked through, and I kept meaning to buy it. Now I may be S.O.L. I just bought it 2 weeks ago from Stuart Ng for full price (60ish) because I couldn't find it anywhere else. Glad there will be a second printing so you can grab it. Its totally worth buying.